Ready to make relevant, sustainable change in your school? 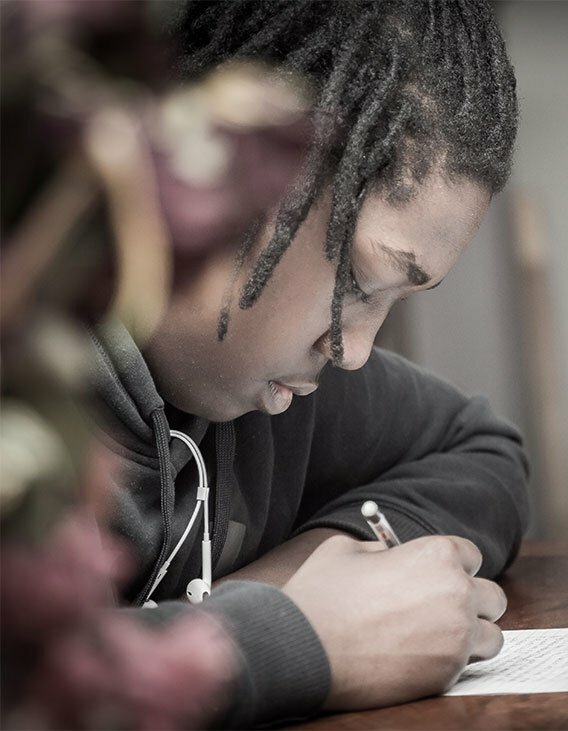 In this free whitepaper, we give you a framework, insights, action steps and links to curated resources for developing kids who are deep, powerful learners. These 10 principles offer a guide to creating real change in schools. Education in the United States and around the world is at an important crossroads. On one side are the centuries old traditions, expectations, and practices of a system of education and schooling created for another time but still deeply rooted in our various cultural fabrics. On the other side is a fast-changing and expanding new story of learning in a globally networked world, one marked by new opportunities and complex challenges, driven by the increasingly ubiquitous technologies that connect us. For over two decades now, as technological, social, and environmental change in the world has continued to accelerate, we’ve been watching the growing disconnect between the old and the new of learning. It’s a disconnect that many in education have felt, and that some have tried to bridge. Now, we are finally seeing signs that the core is beginning to crumble. The profound new realities of the modern world coupled with the re-emergence of our long held (and long ignored) beliefs about how children learn most powerfully are conspiring to create what promises to be a difficult, perhaps painful reckoning for schools as we know them. And, it’s become more and more clear that a fundamental reimagination of our approach to schooling is now required. At Modern Learners, we are digging into the why, what, who, and, importantly, the how of reimagination. In this whtiepaper, we make the compelling case as to why educators and schools urgently need to begin this work. Also, we offer a clear and concise picture of “10 Principles for Schools of Modern Learning” that can serve as a guide to reimagination. In our Modern Learners podcast series, we feature interviews with global change leaders discussing their work to bring true transformation to their students. And, we've had hundreds of educators share their experiences in Change School, our 8-week intensive coaching and community online experience for educational leaders from around the world. To us, this is a critical time for schools. Our deep focus is to build the capacity of educators to lead real change at every level. That effort starts here, and we hope you’ll join us for this challenging and exciting journey. In the United States in particular, this moment is fraught. As political winds grow more unsettled, and as efforts toward privatization continue to strengthen, public school systems face increasingly perilous times. Importantly, this comes at a moment when America’s global “leadership” in education reform appears to be on the wane. Nonetheless, the good news is that a full reimagination of the school experience has already started in a small but growing number of schools and districts around the world. New stories of learning more suited to the modern contexts of life and work are appearing, redefining the value and work of schools and teachers and classrooms. But the bad news is that relevant, sustainable change work in schools requires time, truly visionary leadership, community support and interaction, and more, much of which is in short supply. Today, truly transformative change at a systems level in pre-existing schools is very difficult to find. It’s easier to build a new school than to change an old one. 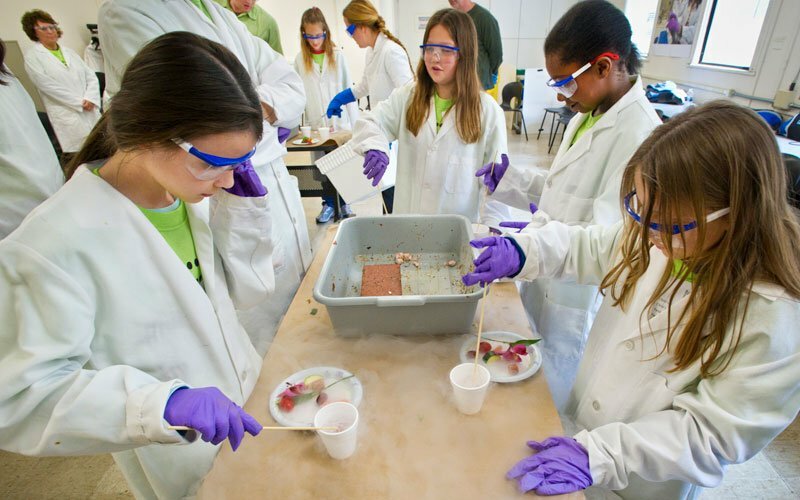 We believe in the idea and the power of local, place-based schools. We believe that learning in face to face spaces with adults and other students is both essential and rewarding. We believe that a shared experience of schooling serves an important function in the development of local, national, and global communities, increasing social justice and the ability to solve problems at a global scale. In short, we are strong advocates for community-based schools. But we are also outspoken in our support for a significant rethinking of the school experience as currently constituted. In short, the new, modern contexts for learning and education and our long held beliefs about how children learn best demand it. Today, truly transformative change at a systems level in pre-existing schools is very difficult to find. It’s easier to build a new school than to change an old one. In schools, we’ve always put efficiency and “doing things right” first and foremost. If we’re honest about it, we know that deep and powerful learning is not best served by the systems and structures that allow us to “deliver an education” as efficiently as possible. Today, however, the advent and explosion of the Internet has given us increasingly abundant access to knowledge, information, teachers and technologies via the smartphones and laptops that we carry with us in our handbags and pockets. If we have a connection and a need or a desire, we can now learn almost anything we want, when we want, wherever we are, with whomever we can find, in whatever way works best for us. More and more, an “education” is what we create for ourselves rather than something someone else creates and delivers to us. In other words today, effectiveness, not efficiency, is the driver of learning outside of the traditional school experience. In essence, access allows us to “do the right thing” when it comes to learning in our own lives. And let us be clear: it is the modern learner’s newfound capability to take full control of his or her learning that is THE educational shift of our times. Given that shift, teachers, parents, and anyone else connected to educating our children now have a choice. On one hand, we can see this shift as a threat to our efficiency model of schooling (which it is) and try to stave it off through half-measures and fancy new language that in the end change little. Or, on the other hand, we can embrace the opportunities (and challenges) of the modern learning world and work for the creation of a fundamentally different, more effective learning experience in schools for all of our children. Obviously, we vote for the latter. If we do fight this shift, we are ignoring common sense. It’s inarguable that striving for efficiency erodes effectiveness when it comes to learning in schools. We all know that the most effective learning doesn’t happen when we take children and separate them by ability, isolate the subjects we teach them, give them little choice over the what and how of learning, try to motivate them with grades, make them sit in rows, and standardize the whole process via one-size fits all assessments. Were we to build a school dedicated to powerful learning, would any of us start with those practices? We wouldn’t. Instead, we’d focus on creating classrooms that “do the right thing,” places where students could act more like adults when it comes to learning powerfully and effectively. We adults know that good learning requires passion and interest, is built around relevance and purpose, isn’t constrained by time limits and subjects, and is measured by our desire to want to learn more. That type of classroom would give preference to effectiveness over efficiency. That type of vision for learning in schools is built on common sense. Are you a school of Modern Learning? 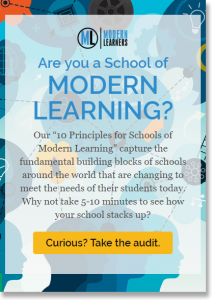 Take our 10 Principles for Schools of Modern Learning audit to find out.